The pathogenesis of macular pseudohole (MPH) is supposed to be different from that of macular lamellar hole (LMH). MPH is thought to be caused by centripetal contraction of previously present epiretinal membrane. 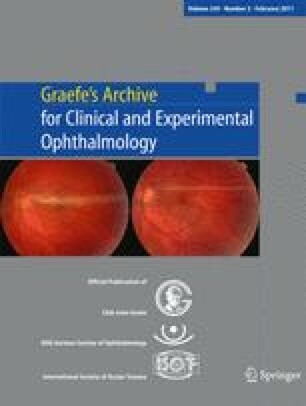 LMH is considered to be an effect of abortive process of full-thickness macular hole formation, or a result of de-roofing of a foveal cyst in persistent cystoid macular oedema. In most cases of LMH, epiretinal membranes are present. The aim of this paper is to show that LMH and MPH may have a common origin and that LMH may evolve from MPH as an epiretinal membrane contracts. Observational two-case series of patients with MPH and epiretinal membrane. Spectral domain optical coherence tomography (SD-OCT) was performed during follow-up. In 6 months of follow-up in case 1 and 2 months in case 2, MPH progressed to non-full-thickness macular defect, fulfilling the criterion of LMH in SD-OCT. Non-vitreous interface traction was detected. SD-OCT proves that MPH may progress to LMH without any vitreous traction. Progressive contraction of epiretinal membranes may be a cause of both MPH and LMH, being an advanced stage of the same non-full-thickness macular disorder. No proprietary interest of any author. No funding was received to support this study.